Using the finest ingredients available, we carefully blend a uniquely different combination of chocolates for each bar in order to compliment and enhance the flavors of the things we mix in, whether they be coffee or tea or spices, naturally dried fruit, or freshly toasted nuts. Each bar is mixed, molded and wrapped by hand so we can assure you the finest chocolate possible. Whortleberry Island – White Chocolate with Dried Blueberries - Whortleberries are a European cousin to the blueberry, smaller, tarter and a deep indigo blue. Also known as bilberry, whortleberries are not native to the area but are now often found growing in and among blueberry patches. For this bar we chose to stay with the native wild blueberry, using lightly sweetened dried berries and mixing them with a creamy, almost smoky, white chocolate. Cow Island – Milk Chocolate with Cinnamon and Pecans - Cow Island was first settled by Captain Paul Pillsbury who was known for his breeding of Guernsey cows. He also built a wind-powered grist mill and was soon grinding grain for all the area farmers. The story is he eventually moved west and founded the Pillsbury Milling Co. In keeping with this tale, we made our bar reminiscent of the cinnamon bun - a blend of milk and dark chocolates, cinnamon and roasted pecans. Black Cat Island – Pure Dark Chocolate - Black Cat Island, located off of the tip of Second Neck in Center Harbor, is one of only four islands on the lake with bridges to the mainland. We made our Black Cat as a smooth blend of three different pure dark chocolates, creating distinct layers of flavor that magically change and develop like the nine lives of a cat – the perfect companion for the Witches. Madame Chiang – Dark Chocolate with Crystallized Ginger - Madame Chiang Kai-Shek discovered the Lake while attending summer school in Meredith in 1908. In the 1940’s she purchased an estate in Wolfeboro as respite from her political life, rallying support for her husband’s Nationalist China. In her honor we have created this bar, a pairing of bittersweet chocolate with the spicy tang of ginger and the sweet relief of raw sugar. Little Bear Island – Dark Chocolate with Crushed Coffee Beans -Settled in the early 1900’s as a summer escape from the hectic pace of the city, Little Bear Island is nestled off the shores of Tuftonboro. In the peaceful town of Tuftonboro, Black Bear Micro Roastery slow roasts their coffee for a rich, exhilarating brew. Smooth dark chocolate, a coffee rush, a subtle crunch – the perfect mesh of the cosmopolitan and the idyllic. Castle in the Clouds - Dark Chocolate with Cocoa Nibs - “Castle in the Clouds,” originally named “Lucknow,” was built by Thomas and Olive Plant in 1913-14 as a country estate. Encompassing 6500 acres stretching from the Ossipee Range to Lake Winnipesaukee, the bulk of the property was acquired by the Lakes Region Conservation Trust in 2003 preserving in perpetuity the pristine grounds, breathtaking views and the historic Arts and Crafts structures. We support these efforts with this elegant bar of pure dark chocolate with the crunch of cocoa nibs. Rattlesnake Island – Dark Chocolate with Cayenne - Viewed from the surrounding mountains, Rattlesnake Island looks like its namesake, with a diamond-shaped head and rattle-like ridges, and legend has it that the island was home to the Eastern Timber Rattler as recently as the 1940’s. We chose to honor this tale with a sensuous dark chocolate that slithers down your throat, and surprises you with the sharp bite of cayenne at the end. Sap House Cove - Dark Chocolate with Maple Sugar - Before the snow melts, before the green grass sprouts, before most birds return from southern climes, generations of people have celebrated spring by tapping our majestic maples and making syrup. Sap House Cove, the namesake of this bar, is located on the eastern face of Little Bear Island. 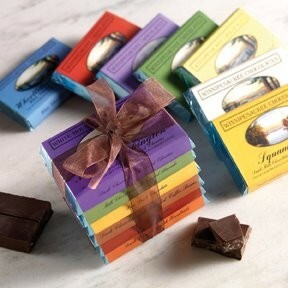 Our bar is a compilation of maple butter crunch (using local syrup) and sumptuous dark chocolate. Enjoy the sweet essence of spring! Mount Major - Dark Milk Chocolate with Cardamom and Pistachios - With less than two miles from the highway to the summit along easy trails, Mount Major is the perfect afternoon hike for families. At 1786 feet, this rocky peak offers stunning views up Alton Bay, across the Broads and on to the White Mountains in the distance. In 1925 landowner George Phippen built a stone hut at the summit. While the roof blew off the following winter, the stone walls remain to provide shelter from the ever-present wind. Barndoor Island – Pure Milk Chocolate - Legend has is that when the gap between Barndoor and Little Barndoor was viewed at the right angle and time of day, a barn door appeared, joining the two islands. In truth, the door was part of a huge barn on the mainland, brought to the islands by a trick of the water and light, but while the building is long gone, the name remains. Our Barndoor is a blend of milk and dark chocolates offering layers of sweet milk and caramel. Mount Washington – Dark Chocolate with Dried Cherries - Known as “Agiockochook”, or “Home of the Great Spirit” to the local Abenaki, Mount Washington sits at the head of the Presidential Range. Mount Washington was one of the earliest tourist destinations in the country, with its first trail laid out in 1819 and the Cog Railway built in 1869 to reach the TipTop House and other summit hotels. With our bar we chose to honor the mountain’s namesake, George Washington, and the legend of the Cherry Tree, blending organic tart cherries in a rich dark chocolate. Kancamagus – Dark Chocolate with Hazelnuts - First opened in 1959, the “Kanc” is a national scenic byway and is considered one of the most beautiful roads in New England. Named for Chief Kancamagus of the Penacook Confederacy, who was forced to flee north after years of trying to maintain peace between his peoples and the encroaching English settlers, the “Kanc” twists over 34 miles, starting along the Swift River in Conway, and climbing to 3,000 feet before dropping back down into Lincoln. Our bar is a classic dark chocolate with a tumble of hazelnuts, like the boulders that dot the route. Christmas Island - Dark Chocolate with Cranberries - Christmas Island is just a stone’s throw from the mainland in the shelter of Plummer’s Point in Paugus Bay. At barely four acres, it is one of the smaller inhabited islands on the lake, but it is one of the few accessable by bridge. For our Christmas Island bar we imagined an idylic scene: a snow covered tree, a star-lit night, a peaceful, frozen lake, and cranberries from a traditional New England Christmas dinner. Lake Wentworth – Dark Chocolate with Almonds - Originally called Smith’s Pond, the 1876 edition of “The White Mountains: A Traveler’s Handbook” was the first to suggest a change to “the more stately and significant” name of Lake Wentworth, after New Hampshire’s Colonial Governor John Wentworth, whose summer estate was on its shores. However, many maps continued to refer to the lake as Smith’s Pond through the late 1920’s. The Flume – Dark Chocolate with Crushed Coffee Beans - First discovered by settlers in 1808, the Flume is a natural glacial gorge that runs 800 feet along the base of Mt. Liberty in Franconia Notch State Park. Separated by less than 20 feet, the sheer, moss-covered, granite walls tower up to 90 feet over the wooden boardwalk and the water gushing below. With scenic pools, glacial boulders, mountain views and the misty gorge, this hike is one of the most spectacular in the region. For our Flume bar we blended a powerful rush of crushed coffee beans with the clean, crisp flavor of pure dark chocolate. Mount Pemigewasset - Dark Milk Chocolate with Cashews and Golden Raisins - Named after one of the last Abenaki chiefs to live in the area, Mount Pemigewasset is located at the southern end of Franconia Notch. Carved by glaciers thousands of years ago, the resulting “Indian Head” was not noticed until a forest fire in 1900 burned away the tall pines that obscured his chin. Craggy cashews and golden raisins in a dark milk chocolate are our salute to this other granite profile. Bench of Friendship - Dark Chocolate with Russian Samovar Spices - On December 13, 1807 the Russian Empire became one of the first nations to formally recognize the fledgling United States. 200 years later, a group of blacksmiths in the Ural Mountains decided to make a bench in celebration of that enduring friendship. The bench, which spends its summers at the Wolfeboro Town Docks, is a reminder that nations are made up of people, and that this is a gift “From People to People”, “Narody ot naroda” and for that we say “Spaciba”, Thank You! The Weirs – Milk Chocolate with Cranberries and Coconut - The Weirs has always been a diverse gathering place, from the early Native American tribes, drawn by the fishing, to the modern revelers of all ages, drawn by the lively atmosphere. Our Weirs is a gathering place too, with the sharp tang of cranberries, the lively crunch of coconut and the smooth caramel of this milk chocolate – a convergence of truly diverse flavors. Becky's Garden - Dark Chocolate with Sour Cherries - At barely 10 feet wide on a good day Becky’s Garden is the smallest charted island on the lake. Legend has it the daughter of an early settler, when offered her choice of any island, chose this brush covered rock so her sisters could have the larger ones. Each summer, a model house, complete in every detail, is placed on this tiny island so it can be called inhabited in Becky’s honor. The Broads – Milk Chocolate with Toasted Almonds - The centerpiece of the lake, with its wide open space and strong breezes, the Broads is the intersection through which all traffic flows. It is also the meeting place of all the competing wakes, as they bounce off the surrounding islands and create a cross-hatch of ever shifting water. Our Broads is a broad expanse of milk chocolate broken-up by the choppy crunch of toasted almonds. Old Man of the Mountain – Milk Chocolate with Chopped Almonds - Geologists speculate that the Old Man looked out over Profile Lake and Franconia Notch for more than 12,000 years. He was first discovered by settlers in 1805 but he existed in Native American legend long before that. Nathaniel Hawthorne made him famous with his 1850 story “The Great Stone Face” and Daniel Webster wrote of him “in the Mountains of New Hampshire, God Almighty has hung out a sign to show that there He makes men.” On the morning of May 3, 2003 the Old Man of the Mountain finally gave in to the ravages of time and fell.